FileMS-1296 - British Columbia Provincial Museum. Modern History Division. FileMS-1304 - Harrison, Eli, 1852-1930. Victoria; Judge. FileMS-1306 - Canadian Institute of Forestry. FileMS-1311 - Wharf, Katherine Isabel Davis. Victoria. FileMS-1312 - Wearing, Norman, ca. 1915-. Vancouver. FileMS-1314 - Baker, Cecil E., ca. 1920. Ganges. File MS-1304 - Harrison, Eli, 1852-1930. Victoria; Judge. Harrison, Eli, 1852-1930. Victoria; Judge. 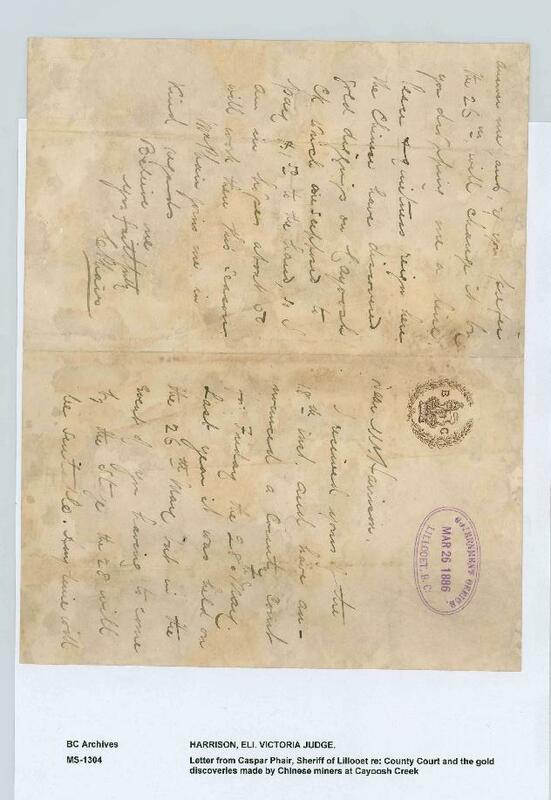 Letter from Caspar Phair, Sheriff of Lillooet, to Mr. Justice Harrison regarding the sitting of County Court and the gold discoveries made by Chinese miners at Cayoosh Creek. Presented to BC Forest Service Museum; transferred to Project 87, 1981; received by PABC, 1982.